For the past three months I have written a piece every time a new month passes in our new home in Baltimore. Today is the three-month mark of making Baltimore our new home. Today is five days after 25 year old Freddie Gray died after suffering a severe spinal injury while in police custody on April 12th. Freddie Gray is a black man who was arrested by Baltimore police after a foot chase. All that I have been able to find is that he was “arrested without force or incident” and that police claim he was carrying a knife which we haven’t seen and there are no claims that I’ve heard that he attempted to use it in any way. I keep going over the published facts. I keep re-watching the video of his arrest. I keep looking for a reason why this man was even arrested, let alone taken down, and is now dead. I want to find a reason to look the other way, to stay distracted, to stay safe and isolated in Canton (which is the super-gentrified part of the city where we live). Here’s the truth: I can’t. 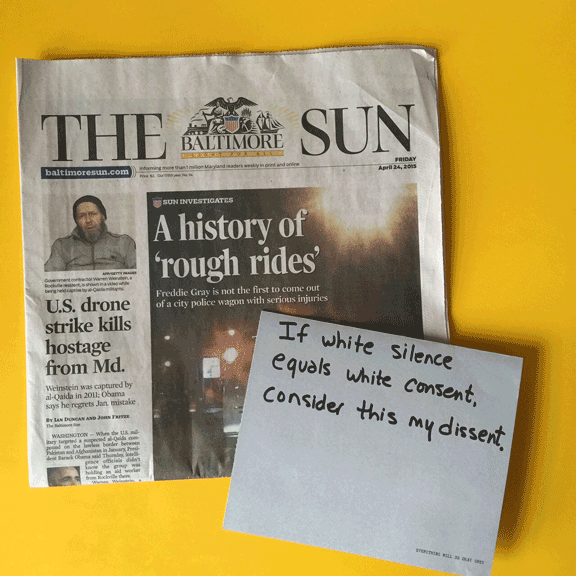 If white silence equals white consent, consider this my dissent. I didn’t feel like I had any license to write about Baltimore because I didn’t grow up here. What right does a white woman from Pittsburgh who lives in an affluent part of town have to write about a city from which she is mostly isolated? And then I remembered the events of Ferguson. And then I remembered that if we’re really all in this together like we keep saying that we are – then we all have to stand up and be counted. We have to stand up and go to the places physically and mentally that are uncomfortable to say that we won’t stand for continued police brutality. We have to examine the way that we are approaching the work we do for our communities. Are we only doing in a way that is isolated? Are we doing more than writing checks and sending people to third world countries to teach yoga and build schools? That work is important for sure AND there is work of equal importance here that we don’t need to travel so far to find. I want to write about this city in the future and tell you that it’s not divided into the Haves and the Have-Nots. I want to write about this city and tell you that things changed across America because people, all people, stopped distracting themselves and stood up to say that what happened to Freddie Gray in Baltimore in April of 2015 will no longer be tolerated. I stand for peaceful protesting and I stand for the end of police brutality. I stand for accountability. I stand for all that is love and light in this world and in order for that to happen then I also stand for the end of violence, the end of intimidation, and the end of suspicion because of skin color.